Cuprime Material Co., LTD., bearing the faith in the aggressive development for new products, has migrated into the field of ever-changing and top-of-the-line demand for electronics wiring material market such as: HI-END stereo cables, communication connection devices, electronics parts, etc. In 2010, we collaborated with MEOA affiliated institutions and adopted OCC manufacturing process (OHNO CONTINUOUS CASTING, JAPAN PAT.1049146) and developed 5N~7N ultra-high purity single crystal copper with glossy, smooth and perfect surface. And now our R&D is migrating to field of special alloy copper. 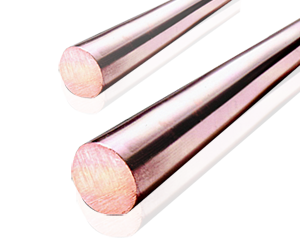 ● Single crystal copper wiring materials They are mainly used in high-end stereo cables, high-tech electronics, communications and internet applications. Single crystal copper has no crystalline boundary interface and can produce superior electric characteristics, signal transmission capability, and is better than the manufacturing functionalities of general copper materials thereby its application is specially used in fields like defense, medicine, commercial electronics, ultra-high-speed transmission communication and internet applications, etc. Single crystal copper can eliminate the signal attenuation source created at crystalline interface therefore possess excellent audio features. With excellent electric and signal transmission capability, coupled with good manufacturing plasticity (with elongation ratio increases more than 2 times), significant stress fatigue resistance (with surface rate reduction increases more than 4 times) whereas it still does not suffer defects resulted from crystal segregation, gas hole, cavity shrinkage and pressure roll, in addition it enhances the glossy and flawless surface quality.